Bonnie Koestner had never seen an opera performance in person until she was a freshman at Lawrence University. And a school-sponsored bus trip with classmates to see Igor Stravinsky’s “Oedipus Rex” at Chicago’s Lyric Opera left her less than inspired. 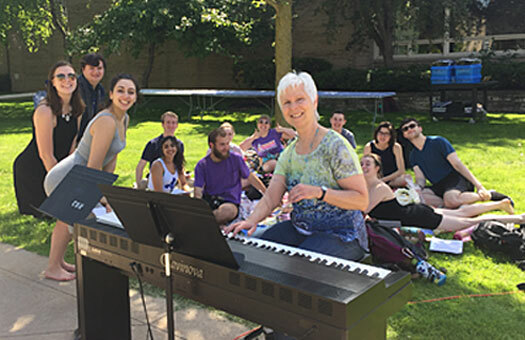 Bonnie Koestner is retiring after 16 years as vocal coach in the Lawrence conservatory of music. But getting a chance to work on an opera production provided the spark that ignited a passion for the art form that has burned intensely for nearly 50 years. 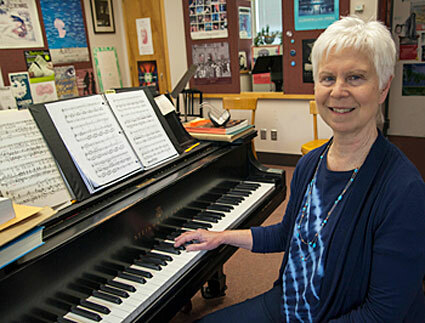 Koestner, a 1972 Lawrence graduate who returned to her alma mater in 2001 as a faculty member, is retiring as an associate professor of music. She will be recognized Sunday, June 11 with an honorary master of arts degree, ad eundem, as part of the university’s 168th commencement. A music education major at Lawrence, Koestner taught middle school in Schofield after graduating, an experience she recalled as both valuable and a likely source of her white hair. After four years, she traded “teacher” for “student” to attend graduate school. She earned a master’s degree in music education at the University of Wisconsin-Madison, where she spent most her free time playing piano for opera productions. Much to her delight, one did — Hidden Valley Opera in Carmel Valley, Calif. — as the company’s chorus master pianist. That job began a 23-year career as an “opera vagabond” as Koestner crisscrossed the country, working with 26 different opera companies on more than 120 opera productions, including Puccini’s “La Bohème” nine times. San Francisco was her base for much of that time. She spent 15 years as the head opera coach for the San Francisco Conservatory of Music and eventually joined the music staff of the San Francisco Opera. During her “freelancing” days, Koestner brought her talents to opera companies of all stripes to work on specific productions. She spent 15 summers as chorus master with Glimmerglass Opera in Cooperstown, N.Y., while some of her many other “gigs” included appointments ranging from rehearsal pianist to artistic administrator with opera companies in Atlanta, Baltimore, Central City, Colo., Miami, Reno, Nev., Sacramento and Salt Lake City, among others. Her work with professional opera companies continued even after she joined the Lawrence faculty. While working in Miami, Koestner learned of a vocal coaching position at Lawrence. Since her brother, also a musician, and her recently retired parents, had all relocated to Appleton, it seemed subliminal messages were being sent her direction. At Lawrence, Koestner has been involved with 17 main stage productions — she cites the challenging comic opera “Albert Herring” by Benjamin Britten staged in 2013 as the Lawrence production she is proudest of — as well as the annual “opera scenes” concert each spring. For Koestner, it’s the “collaborative and multifaceted nature” of opera that has fueled her fondness for it all these years. “My students” is what Koestner says she will miss the most in retirement. Koestner said her own experiences working closely with the opera productions as a Lawrence student served as inspiration for her professional career. She hopes she has instilled a bit of her own passion for opera in her students these past 16 years. While her long-term plans in retirement are still evolving, near term she is eagerly looking forward to returning to Arezzo, Italy for her fourth summer of working with the month-long Oberlin in Italy program for young singers. Five Lawrence students will join her in the program this summer. When she returns to the states, she plans to remain close to family in Appleton and perhaps return occasionally to her vagabond days, watching for an opera gig here or there to assist with.